Hello, Please welcome Howard Raphaelson to the blog. He is an attorney in New York and offered to share some thoughts on travels with children. I have my own experiences traveling with my daughter, but I think it is useful to have another perspective. Airline travel is often stressful enough when it’s just adults traveling, but with children you have to be extra careful when navigating busy airports, adhering to strict Transportation Security Administration (TSA) rules, and following general safety rules. One separated doll hand, missing document, temper tantrum, or another mishap can really put a negative impact on your trip (think “Home Alone”)! The last thing you want to do is have security surprises sprung on you at the airport. It’s your responsibility to learn about and follow TSA rules. There are very specific rules that need to be followed when it comes to details like identification, drinks, snacks, electronics and shampoos (and any other liquids). Place your travel documents in a secure location where they are easy to access when needed. This includes any IDs, passports, birth certificates, immunization records, or tickets. Be ready to present everyone’s ID and tickets when going through TSA security. All adults are required to remove shoes, belts, and jackets when going through TSA screening. Thankfully, children under 12 do not. However, removing these items is just one more thing to keep track of while trying to simultaneously keep an eye on your kids. Make it easier for yourself and wear easy to take off and on items. Previously, TSA rules only required laptops to be removed and placed in a container when going through security and screening. However, recently these rules are in the process of changing and many airports now require smaller electronics to be placed in a separate container. If you’re traveling with tablets or game consoles, be sure you know the rules for the airports you’ll be traveling through so you’re prepared to not have to tear apart your carry-on or personal bags apart to retrieve them. If you’re gate checking your car seat or stroller, these will have to go through the x-ray machines, so you’ll have to take your child out when you get to this checkpoint. Some agents may let you carry your infant in a carrier with you but it’s never a guarantee. For a fee, you can obtain TSA PreCheck and a Known Traveler Number (KTN) which makes for an easier security experience because you’ve been prescreened by the Department of Homeland Security. Currently, this fee is $85 per person and approval is good for five years. Children under 13 do not need a KTN and can go with a parent who has one. Going through this line with kids is a breeze compared to the general security line, especially at busy airports. 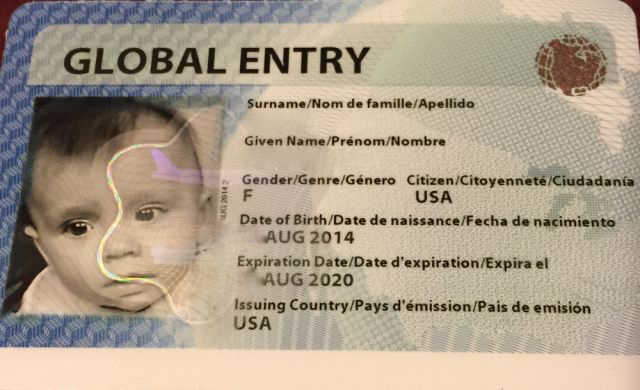 Note: For kiddos traveling internationally, Global Entry is an even better option. Being so many things can go wrong while traveling by air, it’s best to have all everything organized ahead of time to reduce stressful conditions that tend to occur when you’re actually in the airport. Take photos of boarding passes, passports, and any IDs you need for travel. In the event one of these items gets lost during any point of your trip, you have backup information. Take an airport photo of your children—this way if you get separated, you’ll know right away what they are wearing rather than struggling to remember when giving a description to authorities. Point out to your children people of authority—let your children know which strangers are safe to talk to if they need help—airport staff, airline staff, security officers, police. Have children old enough memorize flight information, gate, and destination. Do online check-in—save yourself one less line to stand on with potentially fidgety kids. Explain to your children the importance of practicing safety on an airplane. Be sure they understand the importance of listening to flight staff and announcements during the trip. Additionally, after clearing security, allow your children to get back into their strollers, doing so makes for a far easier trip to the gate in large or busy airports. Airline apps can be a lifesaver these days. Most of the major, and some of the low budget, airlines have their own apps where it stores information related to your flight(s) and gates. It also keeps you up to date with any delays, gate changes, etc. Many airlines are also allowing electronic boarding passes which is an easy scan when boarding your plane. Additionally, there are several other useful Android and iOS-based apps traveling parents find useful. Tip: Remember to enter any reward account numbers into your apps when you fly. You can also set it up so your child receives points too which can result in future discounts or free flights. One item you don’t want to leave behind at home is your secret stash of fun. Be sure to bring some easy to tote toys/games or learn some fun games you can play with your children. Here are some ways you can keep them busy. Bring coloring sheets and crayons. Download fun apps, games, and videos. Pick up some new books. TSA-approved (and not messy) snacks to quell those hungry tummy moments. Think non-refrigeration—dry cereal, crackers, raisins, pretzels, mini-bagels, and more. One thing about air travel is you’ll have plenty of time where you’ll be waiting and you’ll want to find ways to keep the kids happy and avoid meltdowns. Be sure to plan several ways to entertain them. It’s also a good strategy to plan for extra time in the airport to allow for bathroom stops, security delays, or any other unexpected event. Any mishaps can lead to stressful situations and mad-dash rushes to avoid missing flights. This can lead to unsafe circumstances, accidents or lost children. Even if this means you have extra time at the gate to pass, it beats the alternative, you can always find ways to entertain your kids. A little pre-planning goes a long way when traveling with children, it’s better to be safe.